Home » Daniel , How to Succeed in Business Without Really Trying » Sydney Becker meets Daniel during "How to Succeed"
Sydney Becker meets Daniel during "How to Succeed"
Sydney got the chance to meet Daniel during How to Succeed in Business Without Really Trying in New York. Below some more quotes from the article. Sydney was diagnosed with a rare bone cancer. She’s determined to kick this cancer, her courage shining in her daily posts on CaringBridge.org, a nonprofit organization that provides free websites to help family and friends share information and support. Last night was a moment she’ll probably remember four-ever. 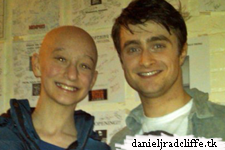 After a full day of tests and meetings with doctors, she headed to the theater to see Daniel Radcliffe in “How to Succeed in Business Without Really Trying.” Sydney – and her mom – are huge fans of Radcliffe, the British actor of Harry Potter fame. “The play was AMAZING,” Sydney writes. With permission from Sydney, we’re sharing in her own words the fantastic adventure that happened after the show. "Finally, Daniel came out and he was very friendly. He was very short though. I was about his height … My mom went to shake his hand, but she was so excited she just hugged him instead. So, we all hugged him. He was very nice.